Let's suppose that a single battery is connected with a wire, which does not have resistance. Electrons will start to flow , in reality, with a wire with resistance, a potential difference would be generated across it. The current would build up until the potential difference is equal to the voltage of the battery. In the case in which potential difference is not created by the wire because there is no resistivity, the potential difference across will immediately become equal to that of the battery. First of all, there is no such thing as a wire with zero resistance. But let’s say there is. But any real battery has internal resistance. See the diagram below. 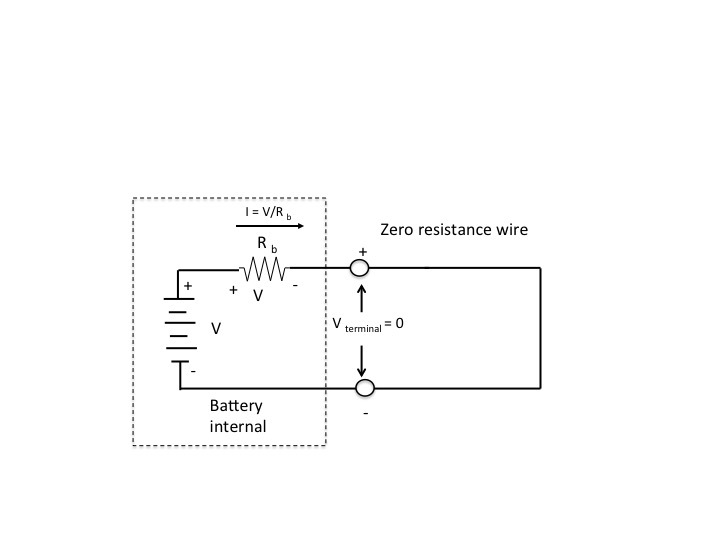 Connected to the battery is a wire with zero resistance. Note that the current that flows in the wire (short-circuit) results in a voltage drop across the internal resistance equal to the internal electrical potential developed in the battery. The voltage across the battery terminals and thus the wire is then zero. Not the answer you're looking for? Browse other questions tagged electricity electric-circuits electric-current batteries short-circuits or ask your own question. Why doesn't current pass through a resistance if there is another path without resistance? Potential Difference of a wire? Why is current slowed down by resistance? Why doesn't the potential difference across an inductor increase over time? Is my understanding of current correct?Urgent help is needed! Current in infinitely long wire? How does current flow in a short circuit?